Asia’s New Wings will re-launch on August 25th, 2015. Asia was aboard Flight 77 that crashed into the Pentagon on the fateful morning. On her way to an exciting school trip to California, she was just 11 years old at the time of her death. Now, her story is told through her parent’s recollection of her love, laughter and light. Asia’s New Wings offers hope to others who have sustained loss and illuminates Asia’s love of learning and wishes for the happiness of others. The book was originally released through Next Century Publishing and is available for purchase at http://www.asiacottom.com/book/. For Clifton and Michelle Cottom, the death of their daughter Asia on September 11, 2001, was a tragedy that they can never forget. However, they were determined that their beautiful daughter’s memory not be forgotten, and as a result they set up the Asia SiVon Cottom Memorial Scholarship Fund to help those who need financial support attend to college. The Asia SiVon Cottom Memorial Scholarship Fund, located online at http://www.asiacottom.com/scholarship-fund/, offers financial assistance to deserving students who have demonstrated academic success and financial need. So far, the scholarship has helped to fund dozens of young people’s education, including those who have now graduated from law school and other graduate programs and are giving back to their own communities. 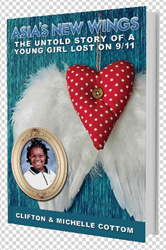 Asia Cottom was only 11 years old when she was killed during the September 11 terrorist attacks, but her death inspired many to embrace her belief in hope and positive thinking. Her parents have now released a new book through Next Century Publishing, Asia’s New Wings, that tells her story. Next Century Publishing is the world’s first hybrid publisher and offers authors the chance to brand themselves and their work as experts in their fields through innovative marketing methods.